• We combined stem volume increment analysis with dendroecological tools to address two unresolved issues concerning oak dieback in Mediterranean areas: early detection of changes in stand growth, and identification of mechanisms for observed growth declines. 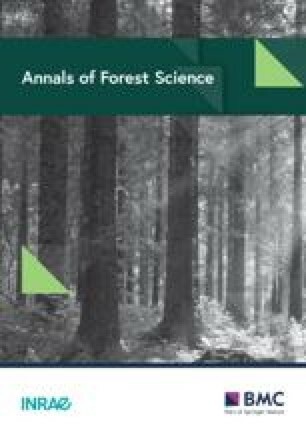 • We reconstructed productivity of a stored coppice formed by Turkey oak (Quercus cerris) to test if its growth decline was linked to climatic variability, while also accounting for age-related and sociological factors. • Drought in May–June and in prior-year late summer-autumn was negatively correlated with current growth during 1974–2006. Previous November water balance was the strongest signal. Moving Correlation Functions (11 y windows) indicated that the May–June signal remained dominant until 1996, thereafter falling to non-significant values in parallel with the May–June water balance drying trend; at the same time the previous autumn correlations reached significant values. Since 1994 there was a two-year lagged response to June water balance, suggesting that, when growth declined, loss of current-year climate signals was accompanied by the emergence of previous-year ones. • Growth and productivity of deciduous oaks in Mediterranean environments is linked to late spring-early summer hydrologic balance; at both annual and decadal timescales, oak growth decline was associated with a delayed response to climate.